The early Kings and Emperors have built palaces at various places in the world. Out of all the royal palaces, one palace was the oldest and renowned. It is still being used as a residential palace. 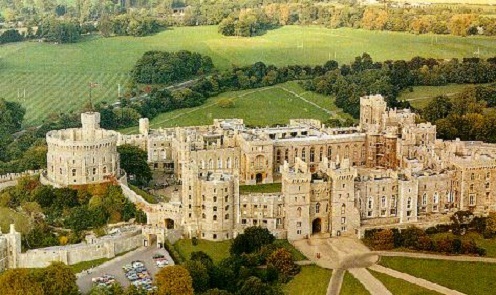 It is the Windsor Castle in England. Windsor palace is one of the official residences for royal family of British. It has history of 1000 years. In this palace, kings & Emperors have walked, prisoners moved and accused persons were hanged. Palace lies in a vast area of 13 acres. It is surprising to know that there are thousand rooms in this palace. This palace has seen two world wars. It also withstood a big fire accident. Elizabeth II, Queen of England will be residing in this palace for a few weeks even now. When the queen is residing in the palace, one type of flag will be hosted and in the absence of queen, another type of flag will be hosted at the top of palace as a signal to indicate the presence of queen. England’s Emperor William has started the construction of Windsor palace in 1070 A.D. at the banks of river Thames in Windsor region of Berkshire County. Initially this palace was built completely with wood. Later, successive Emperors changed it in to a stone construction. It expanded gradually and reached to 4,84,000 square feet. On the compound wall of it, 17 big cannons were arranged. This palace was earlier well known as the prisoner’s jail and the burial place of royal family. In 1642, a bill was kept in the parliament to collapse this palace. The one vote majority at that time had saved the palace. In 1992, a big fire accident happened. Due to continuous fire for 15 hours, hundred rooms were completely damaged. To built them again, 300 crore rupees were spent. In 15th century, at the time of spreading of plague disease in London, Queen Elizabeth I resided here. She ordered hanging of persons who come from outside. There are 300 employees in the Windsor Castle. Four hundred and fifty clocks are present in Windsor castle. Three lakh books are available in the library.